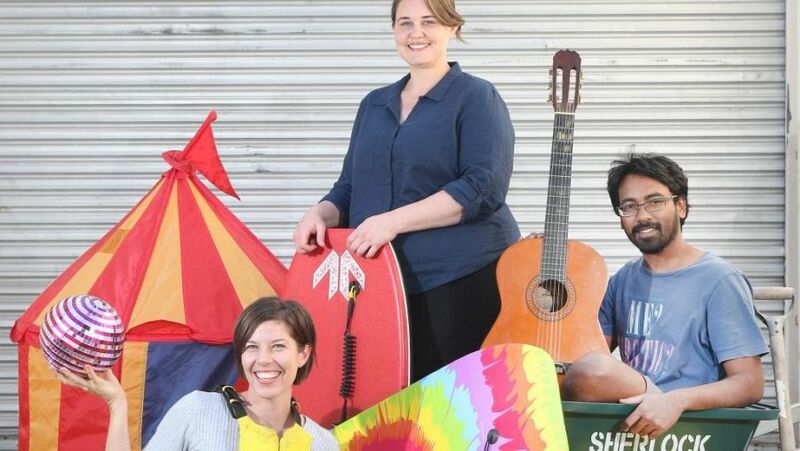 A SHARE shed, where members can share everything from lawnmowers to kayaks, disco balls, unicycles and a chocolate fountain, will open at Salisbury this month. “The share shed will allow members to borrow useful items like a lawnmower, a bread maker, a tennis racquet or a disco ball, all for the price of an annual membership,’’ Ms Bray said. Ms Bray said there was enormous support in the community for the concept. “We knew the idea was popular but the amount of community support we have received has been overwhelming,’’ she said. Fellow founder Ms Pember said: “We are able to open so soon because of public donations of items and assistance. “There is no restriction for us on item type – except our purpose is really about stocking items people only use occasionally so that every household doesn’t have to buy, store, insure and maintain them,’’ said Ms Pember, explaining among the 100 items donated was a Steinberger guitar. Ms Bray said the $80 annual membership “entitled you to everything we have’’. “We are one central point. It is run as a business but we are not-for-profit. We are invested in the longevity of the project,’’ Ms Bray said. Ms Bray said they tested public feedback for the concept on the Moorooka Grapevine Facebook page. “We got lots of responses,” she said. Cr Steve Griffith (Moorooka), who donated a wheelbarrow, praised the concept. The shed opens on September 30, 10am-12pm, at 1/8 Textile Cres, Salisbury.